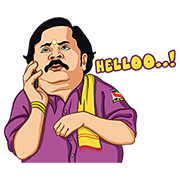 http://www.line-stickers.com/ – SAB Funtickers Line Sticker | These stickers from SAB TV shows are guaranteed to light up your chats! Chidiya Ghar, Baalveer and Badi Dooooor Se Aaye Hai are all here! Available till March 9, 2016.